The 'big' dogs have had a bit of a poor deal since the arrival of the Octopups, they're not getting out as much as they normally would. Yesterday we had a visit to the vet for a check up so on the way home we called at a friend's farm, plugged the puppies in to the mains on a heat pad and all the dogs, except for Arctic Fox, went for a good walk. Inevitably there were a couple of photo sessions during the walk - a very windy day with a very grey and menacing sky, perfect! 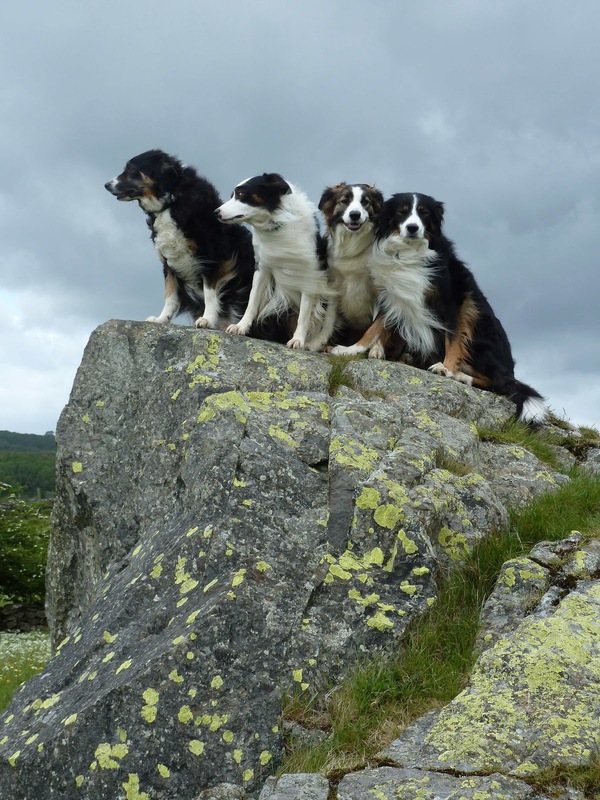 This rock is a favourite perch for the dogs ... so how do they get off? I think that is a perfect name for a new pub drink. "Yes, thank you, I'd like a 'Dogs on the Rocks,' please."